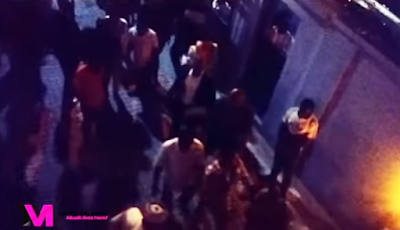 In a press release by his team,he was in the VIP section of the club when he sighted Sound Sultan and Rock steady being denied access to the VIP section.He then went to the bouncers and asked them why an A list artist like Sound Sultan would be denied access.He was then told that the owner of the club,Shina Peller had issued instructions not to let any A list artist in the VIP section.Especially Sound Sultan as they don't patronize the club. So according to the singers team press release,they said it was at this point that while trying to persuade them to let Sound Sultan and Rock steady in,one of the bouncers rough handled him,while trying to defend himself,the drinking glass in his hand brushed the bouncers face and he had a cut...hahahahaha..which kind story be this? But the contrary gist by eye witnesses is that Femi had slapped the bouncer and in return the bouncer beat him up,it was while he was being beaten that he then stabbed the bouncer with the glass on the face. Anyway,this resulted into a fight as you can see in the video below.The bouncers grabbed hold of Femi,beat jim up badly and he claims in the process they stole his jewellery worth over N8m.Double Wahala indeed. The police was then called and took them all to the station.At the station Oritsefemi was made to give the bouncer money to look after himself and in return the police asked the bouncers to return the jewellery.But the singers team say this has not been done yet. This musicians really need to be careful,somebody is gonna get killed some day if care is not taken.This Quilox night club is the same club where Wizkid and Dammy Krane got into an altercation with a drinking glass. 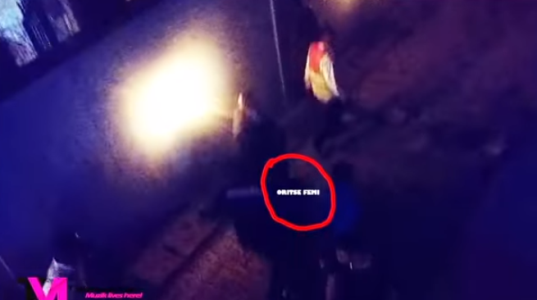 Watch a clip from the scene below..